Portrait of Kossinna with an example of excavated pottery. Gustaf Kossinna (28 September 1858 in Tilsit – 20 December 1931 in Berlin) was a linguist and professor of German archaeology at the University of Berlin. 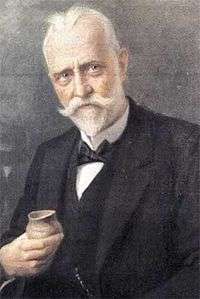 Along with Carl Schuchhardt he was the most influential German prehistorian of his day, and was creator of the techniques of Siedlungsarchaeologie, or "settlement archaeology." His nationalistic theories about the origins of the Germanic peoples influenced aspects of Nazi ideology; nevertheless, he was rejected by the party as their official prehistorian. Kossinna was a Germanized Mazur. He was born in Tilsit, East Prussia, Kingdom of Prussia. His father was a teacher at the secondary-school level. As a child he learned Latin and piano. As a university student he matriculated at a number of universities, studying classical and Germanic philology in Göttingen, Leipzig, Berlin and Strassburg. He was influenced greatly by K. Muellenhoff, who encouraged him to research the origins of Indo-European and Germanic culture. He obtained his doctorate at Strasbourg in 1887 in the subject of the early records of the high-Frankish language. From 1888 to 1892 he worked as a librarian. In 1896 his ideas were expressed in his lecture "The Pre-historical Origins of the Teutons in Germany". In 1902 he was appointed as Professor of German archaeology at the University of Berlin. In the same year he identified the Proto-Indo-Europeans with the north German Corded Ware culture, an argument that gained in currency over the following two decades. He placed the Indo-European urheimat in Schleswig-Holstein. Thereafter he published many books on the origins of the Germanic peoples, founding the "German Prehistory Society" to promote interest and research in the subject. He became the most famous archaeologist in the German-speaking world, and was notable for his use of archaeology to promote claims for an expanded German nation. Kossinna developed the theory that a regionally delimited ethnicity can be defined by the material culture excavated from a site (clture-historical archaeology or simply culture history theory). He wrote, "Sharply defined archaeological cultural areas correspond unquestionably with the areas of particular people or tribes". The statement is known as "Kossinna's law" and forms the basis of his "settlement-archaeology" method. Unlike modern settlement archaeology, which refers only to individual settlements or patterns of settlement, Kossinna meant to emphasise, in Stefan Arvidsson's words, that "a unified set of archaeological artifacts, a 'culture', was the sign of a unified ethnicity." Thus, Kossinna's ideas were closely tied to the German "völkisch movement". There is no proof that material remains equated to ethnicities. There is often arbitrary distinction of between trade and "migration"
There is no investigation of the causes of "migrations"
There is an influence from nationalistic and sometimes racist prejudice, which were politically cannibalised, in particular by the Nazis. Despite justified criticism of the method and its application by Kossinna, the central technique was not unique to him, but it has also developed elsewhere in Europe and the US. Even today, it has an important role to play in the mapping of prehistorical cultures. Kossinna's ideas have been connected to the claim that Germanic peoples constitute a national identity with a historic right to the lands they once occupied, providing an excuse for later Nazi annexations of lands in Poland and Czechoslovakia. For example, in his article "The German Ostmark, home territory of the Germans" Kossinna argued that Poland should be a part of the German empire. According to him, lands, where artifacts had been found that he considered to be "Germanic", were part of ancient Germanic territory. In 1919 he allegedly sent a copy of his book "The Vistula Area, an ancient homeland of the German people" to the Versailles conference in order to emphasise that territory claimed for the new Polish state should be German. Kossinna's popular publications encouraged such thinking. One of his best-known books was Die deutsche Vorgeschichte - eine hervorragend nationale Wissenschaft (German Prehistory: a Pre-eminently National Discipline). Here Kossinna introduced the idea that an Aryan race, superior to other peoples, could be equated with the ancient Germans, arguing that Germany was the key to the unwritten history of the ancient world. The purpose of the book is clear from the beginning, as the dedication reads, "To the German people, as a building block in the reconstruction of the externally as well as internally disintegrated fatherland." Kossinna emphasised a diffusionist model of culture, according to which cultural evolution occurred by a "process whereby influences, ideas and models were passed on by more advanced peoples to the less advanced with which they came into contact." He also emphasised that such superiority was racial in character - the special gift of the "Nordic" peoples of Germany. Kossinna’s Germanic ethnocentric theories aimed to present a history of Germany superior even to that of the Roman Empire: an expansive and powerful culture that spread civilization through heroic migrations. As he argued, "Germanic people were never destroyers of culture, unlike the Romans - and the French in recent times." Combined with Nazi ideology, this theory gave the perfect foundation for the belief that Germany occupied the leading position in world civilization. 1 2 Klein, page 233.